Since the Philippines is a Roman Catholic country, church bells have played a big part in its history. Primarily used to call the faithful to prayer, the tolling of church bells has also been used as heralds of good news, marking times of celebration or announcing the arrival of visiting dignitaries, as gestures of honor or sadness, marking the passing of a prominent citizen for example, and as presages of disaster, forewarning the townsfolk of things such as great fires that were fast spreading or invading troops ready to wreak havoc. It was said that the boundaries of a parish were defined by how far the sound of its bells could reach. And thus, church bells also united each Filipino community. The church bells of the 250-year old City of San Fernando, Pampanga are no exception. This is why concerned civic leaders, hearing the waning peal of the centuries-old bells of the City’s Metropolitan Cathedral, sought to revive old memories by bringing the church bells back to life. The San Fernando, Pampanga Heritage Foundation, Inc. was formed on July 31, 2003 as a contribution to the heritage conservation and cultural revival campaign of the City of San Fernando. It’s founding trustees include Chairman Levy P. Laus, President David L. Jimenez, as well as Senen P. Quiambao, Antolin P. David, Antonio O. Koh, Quirino T. Kehyeng, and Ivan Anthony S. Henares. 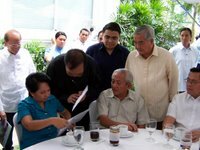 It was during one of its initial meetings some time in the latter part of 2003 that the bell project was brought up by Chairman Levy P. Laus and historian Ivan Anthony Henares. After preliminary conversations with Cathedral Rector Msgr. Cenovio M. Lumanog, it was discovered that the three remaining centuries-old bells were in a bad state – two were cracked and no longer functional while the largest produced a bad sound as a result of wear and tear due to the many years it had been in use. There was thus a need to replace them soonest and a meeting was set with the Archbishop Paciano B. Aniceto, D.D. to propose the project. The church bells project actually struck a chord with the members of the young foundation. Laus himself remembers going up the belfry as a young kid growing up in San Fernando. And hearing the bells peal again would elicit good memories and call the San Fernando community back to its roots. Upon the recommendation of Prof. Regalado Trota Jose of the National Commission for Culture and the Arts, it was decided that new bells would be purchased. According to Jose, marks on church bells such as cracks and bullet holes are part of its history. Thus, instead of “restoring” church bells, they should instead be decommissioned and displayed in a prominent place, as a tribute to their historicity. For the new bells, the group contacted the Philippine agent of Petit en Fritsen b.v. Holland, a foundry that has been manufacturing bells since 1660. Although there were some initial problems, funding the bells was a breeze thanks to the generous donations of four families. The total cost of the three bells ordered amounted to a little over two million pesos. The largest of the bells, which weighed half a ton, was funded by Levy P. Laus and family. For the second bell, Msgr. Lumanog solicited the support of the Singian-Lazatin family, descendants of Don Serfain Lazatin and Doña Encarnacion Singian, who immediately obliged knowing the significance of this historic project. The cost of third bell was divided among the families of Antonio O. Koh and Senen P. Quiambao. Each bell contained 20 percent tin, half a percent of lead, 1.5 percent zinc, antimony with iron and the balance of some 78 to 80 percent in copper. The clapper is made of construction steel and the clapper balls of manganese bronze, a metal softer than the bells themselves. 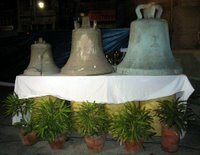 It is said that the reason bells in the Philippines easily crack was because of the fact that their clappers were made of the same metal or one that was harder. With the bells ordered and scheduled to arrive in December 2004, plans were made for their inauguration. To make it meaningful, the foundation decided to coincide the first pealing with the first simbang gabi on December 16, 2004. And to even make it more meaningful, the foundation invited none other than Her Excellency President Gloria Macapagal-Arroyo as guest of honor. And to ensure her attendance, members of the foundation trooped to the White House in Clark during one of the president’s visits on November 13, 2004 to personally hand her the invitation. The president immediately obliged. On December 6, 2004, the bells finally arrived at the Manila International Container Port in North Harbor. As part of the ceremonies to welcome the bells, members of the foundation and other guests, who rode to Manila in CarWorld’s brand new Rosa van, were personally seen off by City Mayor Osacar S. Rodriguez. At the port area, Msgr. Lumanog, and SFPHFI trustees Laus, Jimemez, Kehyeng, Quiambao and Koh welcomed the arrival of the bells, with the assistance of Deputy Collectors of Customs Mssrs. Ronnie Silvestre and Philip Bartolome. 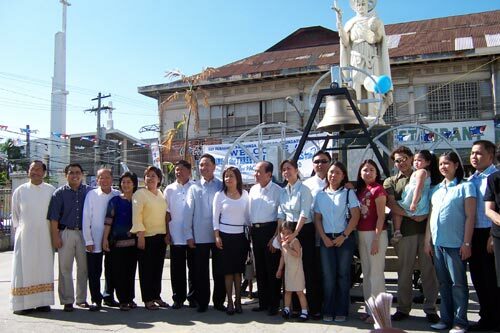 The following Monday, December 8, 2004, the three bells were blessed in solemn ceremonies by Archbishop Aniceto together with all the parish priests of San Fernando, the trustees of the foundation, the donors and their families, as well as city officials lead by Mayor Rodriguez. And finally, as had been planned, President Arroyo led the inauguration of the new church bells during the early hours of December 16, amid a lot of fanfare and celebration. After the inauguration, a traditional Kapampangan breakfast was served at the Plaza Vidal de Arrozal in the City Hall of San Fernando. The centuries-old church bells were housed at the side of the Cathedral in a bell house donated by the San Fernando Jaycees Senate. 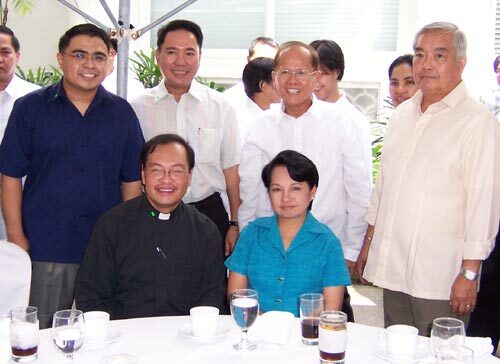 This was blessed and formally turned over to the Archdiocese on March 8, 2005, which coincided with the induction of new officers of the San Fernando Jaycees Senate together with the San Fernando Cabalen Jaycees. As the SFPHFI puts its first project to a close, it looks forward to more projects that aim to preserve and promote the rich history and heritage of the City of San Fernando, Pampanga.